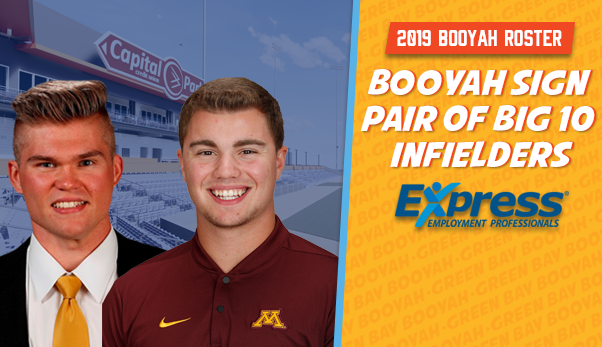 Ashwaubenon, Wis.- The Green Bay Booyah have announced the addition of two Big Ten infielders by signing first baseman, Tanner Padgett (Iowa) and middle infielder, Zack Raabe (Minnesota). Padgett, a 6-foot-6 junior has an impressive track record in the Junior College ranks. As a freshman at Johnson County CC he boasted an impressive .382 average (86-225) with 16 home runs, 14 doubles, 61 RBIs, and 53 runs. Padgett’s 86 hits ranked fourth in the conference and 14th in the NJCAA, it was the most ever by a Johnson County CC freshman and the second-most in a single season in school history. Coming off an injury ridden sophomore season, Padgett is ready to contribute for the Hawkeyes this spring. Raabe, a 5-foot-10 freshman from Forest Lake, Minnesota, is coming off a great senior season where he was nominated for Mr. Baseball in the state of Minnesota. During his high school career Raabe racked up 2018 Star Tribune All-Minneapolis Second Team, All-Suburban East Conference, and All-Section Honors. He ranked as the no. 1 infielder and no. 6 overall player in the state of Minnesota according to Prep Baseball Report. He has been described as a ‘gamer’ and a player who will do all the little things to help his team win. 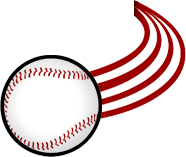 Zack’s father Brian earned All-America Honors at Minnesota and played three seasons in Major League Baseball. The next time you’re looking to bring new staff onto your team, make sure to contact Express Employment Professionals. Express is a leading staffing provider that helps job seekers find work and businesses find qualified employees.